The system can program a maximum of 4 remotes in it's memory and once it's in programming mode it will reset it's memory so make sure to program your existing remotes as well. 2. Press the valet button 4 times. 3. After a few seconds the unit Chirps, Siren, Horn and Flashes the parking lights 4 times. 4. Press the LOCK button. You should get 1 Chirp/Honk indicating the first remote is coded, and then press button #1 of a second transmitter, the unit will Chirp/Honk twice indicating the second remote is coded and so on. If all 4 codes are learned, the unit will automatically exit code learning mode, otherwise tum key off. 5. The system will Chirp/Honk 4 times when exiting learning mode. Note: All transmitter codes must be learned at time of programming!! The system learns up to 4 different transmitter codes. 2. Press Programming button 4 times. then after a few seconds the unit Chirps, Siren, Horn and Flashes the parking lights 4 times. button #1 of a second transmitter, the unit will Chirp/Honk twice indicating the second remote is coded and so on. If all 4 codes are learned, the unit will automatically exit code learning mode, otherwise tum key off. 4. The system will Chirp/Honk 4 times when exiting learning mode. Please Read: The system can program a maximum of 4 remotes in it's memory. After programming your new remote you will need to reprogram the existing ones. 1. Twist the key in the ignition to ON position. (Don't start the engine and the pink wire must connected). 2. Press valet button 4 times, then the system will flash the parking lights 4 times. 3. Press the LOCK button then you should get 2 light flashes which means the remote has been programmed and waiting for a 2nd code. 4. 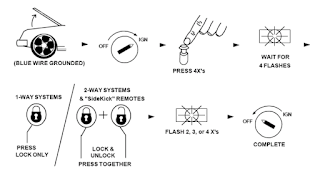 If you have another remote, press the LOCK button on that remote, then the system will flash the lights 3 times indicating it's waiting for the 3rd code and so on. If all 4 remotes are programmed, the system will automatically turn the programming mode OFF, otherwise turn the ignition OFF to do it manually. NOTE: All transmitter codes must be learned at time of programming!! 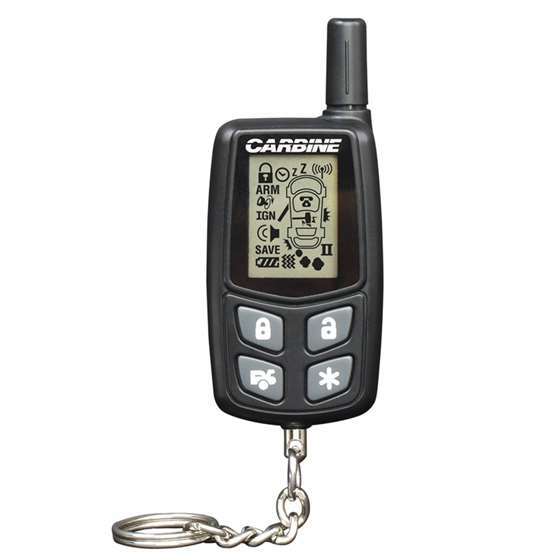 These systems allow storage of up to 4 different remote codes in memory. 1. Turn key to the ON position. (Do not start the engine). Pink wire must be connected! 2. Press Program/Valet button 4 times, then a few seconds the unit flashes the parking lights 4 times. 3. Press button #1 of the transmitter to be coded. 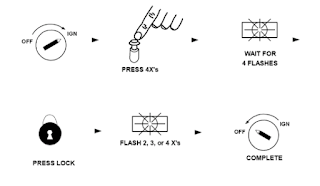 You should get 2 light flashes indicating the unit is waiting for a 2nd code, then press button #1 of a second transmitter, the unit will flash 3 times indicating it's waiting for the 3rd code and so on. If all 4 codes are learned, the unit will automatically exit code learning mode, otherwise turn key off. See diagram below. INSTRUCTION: The system can program a maximum of 4 remotes in it's memory. After programming your new remote you will need to reprogram the existing ones. 2. Press Program/Valet button 4 times. Wait for the unit to flash the parking lights and/or honk horn exactly 4 times. 3. RS-3, RS- 4: Press button#1 (Lock) of the transmitter to be learned. 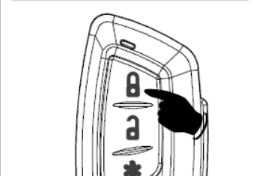 2-Way systems: Both the Lock & Unlock buttons must be pressed. You should get 2 light flashes and 2 horn honks indicating the code-learn. Now the unit is waiting for a 2nd code, so repeat this step as needed with up to 3 additional remotes. The unit will flash the lights in succession after each code learned for up to 4 codes. 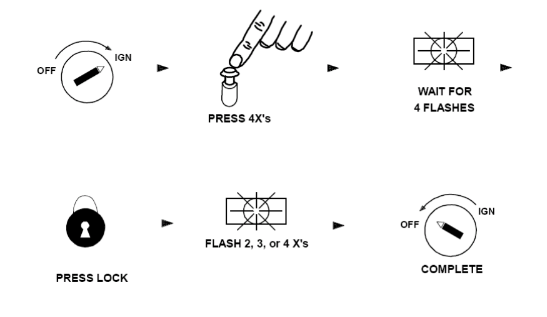 (3 flashes for the 2nd code, 4 flashes after the 3rd code and 0 for 4th code.) If all 4 codes are learned, the unit will automatically exit code learning mode, otherwise turn key OFF. Notes: Remote Transmitters/Transceivers come pre-programmed from the Factory. When re-learning remotes or adding remotes, ALL your system's remote codes must be learned at time of programming!! These systems aloow storage of up to 4 different remote codes in memory. The "Sidekcik" transmitters for the TW1/TW2 and FM systems are a special model that is not compatible with each other. 2. Twist the key in the ignition to ON position. (Do not start the engine) Pink wire must be connected! 3. Press the valet button 4 times. Wait for the system to flash the parking lights and/or honk horn exactly 4 times. 4. For 1-Way system: Press the LOCK button on the remote. 2-Way systems: Press LOCK and UNLOCK button at the same time. You should get 2 light flashes and 2 horn honks which mean remote have been programmed. Now the system is waiting for a 2nd code, so repeat this step as needed with up to 3 additional remotes. The unit will flash the lights in succession after each code learned for up to 4 codes. (3 flashes for the 2nd code, 5 flashes for the 3rd code and 0 for 4th code.) If all 4 codes are learned, the unit will automatically exit code learning mode, otherwise turn key OFF and close the hood. Attention: Your system can only save 4 remotes in it's memory. Make sure to reprogram your existing remote and program the new ones. This "Sidekick" transmitters for the TW1/TW2 and FM systems are a special model that is not compatible with each other. 2. Twist the key in the ignition to ON position. (Do not start the engine and pink wire should be connected). 4. For 1-Way system: Press the LOCK button on the remote. 2-Way systems: Press LOCK and UNLOCK button at the same time. You should get 2 light flashes and 2 horn honks which mean remote have been programmed. 6. If all 4 codes are learned, the unit will automatically exit code learning mode, otherwise turn key OFF and close the hood. Your system can only save 4 remotes in it's memory. Make sure to reprogram your existing remote and program the new ones. 6. If all 4 codes are learned, the unit will automatically exit code learning mode, otherwise turn key OFF. Please Note: The system can program a maximum of 4 remotes in it's memory. After programing your new remote you will need to reprogram the existing ones. The "Sidekick" transmitters for the TW1/TW2 and FM systems are a special model that is not compatible with each other. 2. Turn key to the ON position. (Do not start vehicle) Pink wire must be connected! 3. Press Program/Valet button 4 times. Wait for the unit to flash the parking lights and/or honk horn exactly 4 times. 4. 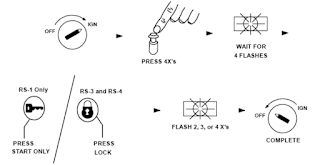 1-Way systems: Press button#1 (Lock) of the transmitter to be learned. 2-Way systems: Both the Lock & Unlock buttons must be pressed. You should get 2 light flashes and 2 horn honks indicating the code-learn. Now the unit is waiting for a 2nd code, so repeat this step as needed with up to 3 additional remotes. The unit will flash the lights in succession after each code learned for up to 4 codes. (3 flashes for the 2nd code, 5 flashes for the 3rd code and 0 for 4th code.) If all 4 codes are learned, the unit will automatically exit code learning mode, otherwise turn key OFF and close the hood. Note: You're only allowed to program 4 remotes to this system. After programming the new remote you'll need to reprogram the existing once. Follow steps below to program the new and existing remotes. 1. Twist the key in the ignition to ON position (don't start the engine) then press the valet button 4 times. 2. Parking lights flashes 4 times, siren chirps 4 times, horn honks4 times and LED light ON solid. 3. Press LOCK and UNLOCK button at the same time. You should get 2 light flashes, 2 siren chirps and 2 horn honks (optional) which means the system/receiver is ready to program your 2nd remote. (If you only have 1 remote, just skip step 4 to 5 and perform step 6). 4. Press the LOCK and UNLOCK button on your 2nd remote, then the system/receiver will flash 3 times, 3 siren chirps and 3 horn honks. 5. Press the LOCK and UNLOCK button on the 3rd or 4th remote. he system will not flash the lights when learning the 4th code. 6. Twist the key in the ignition to OFF position to turn programming mode OFF. Attention: This system can save up to 4 remotes in it's memory. After programming your new remote you'll need to reprogram the existing once since the system will reset it's memory once it entered programming mode. Perform the steps below to program your new and existing remotes. 1. Twist the key in the ignition to ON position then press the valet button 4 times. 2. Your system/receiver will flash the parking lights 4 times, siren 4 times, horn 4 times and status LED will turn on solid. 3. Press the LOCK and UNLOCK button at the same time. 4. You should get 2 light flashes, 2 siren chirps and 2 horn honks (optional) which means the system/receiver is ready to program your 2nd remote. (If you only have 1 remote, just skip step 5 and 6 then do step 7). 5. Press the LOCK and UNLOCK button on your 2nd remote, then the system/receiver will flash 3 times, 3 siren chirps and 3 horn honks. 6. Press the LOCK and UNLOCK button on the 3rd or 4th remote. he system will not flash the lights when learning the 4th code. 7. Twist the key in the ignition to OFF position to exit programming mode. Please Note: Make sure to reprogram your existing and new remote. And you can program up to 4 remotes to the system. 1. Turn the ignition ON and press the valet button 4 times. 2. The system will flash the parking lights 4 times, Siren 4 times, Horn 4 times and status LED will turn on solid. 3. Press the Button #1 (lock) and Button #2 (Unlock) together on the remote at the same time. 4. You should get 2 light flashes, 2 siren chirps and 2 horn honks (optional) indicating the system is waiting for the second code to be programmed. 5. Press button #1 and #2 together of a second remote, the unit will flash 3 times, 3 siren chirps and 3 horn honks. Press the lock and unlock button on a 3rd or 4th transmitter for up tp 4 total. Note: The unit will not flash the lights when learning the 4th code. Turn key off to exit programming mode. NOTE: All transmitter must be learned at the time of programming. This system can learn up to 4 remotes. 1. Turn key to the ON position and press button 4 times. 2. After a short delay, the unit will flash the parking lights 4 times, siren 4 times, Horn 4 times and status LED will be solid. 3. Press the Button #1 (lock) AND Button #2 (Unlock) together on the remote you wish to program. 4. You should get 2 light flashes, 2 siren chirps and 2 horn honks (optional) indicating the unit is waiting for the second code to learn. Press button #1 and #2 together of a second transmitter, the unit will flash 3 times, 3 siren chirps and 3 horn honks. 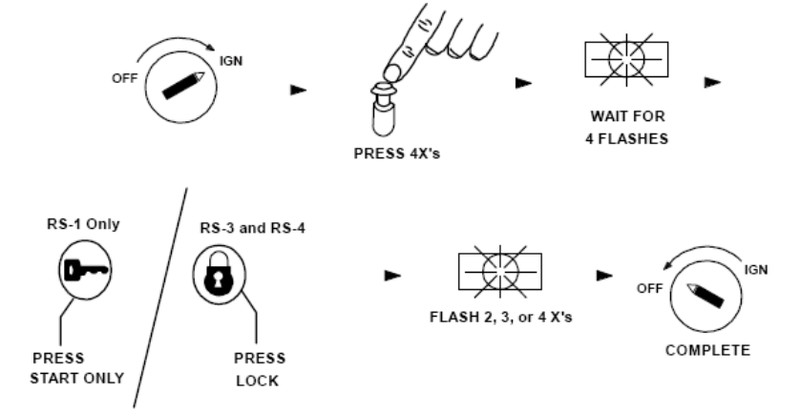 Press the lock and unlock button on a 3rd or 4th transmitter for up to 4 total. Note: The unit will not flash the lights when learning the 4th code. Turn key off to exit programming mode. SYSTEM can learn up to 3 different codes max. Please Note: These types of system can only keep up to 4 remotes codes in it's memory. 1. 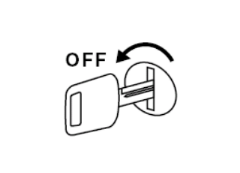 Turn the ignition ON and OFF 3 times from OFF position then leave it to the ON position. 2. Press the valet switch 5 times then light flashes 5 times and siren chirps 6 times. 3. Press #1 (LOCK) button on the remote twice for the 360, 336, 365, 366tx's and once for the regular TX. 4. Repeat the steps above to add another remote. 5. Turn the ignition off. Siren will chirp 3 times and lights flashe 3 times which means programming mode is OFF. Perform all the steps below to program the remote: System can learn up to 3 different codes max. 1. Turn the Ignition ON and OFF 3 times quickly, leaving it ON the 3rd time. 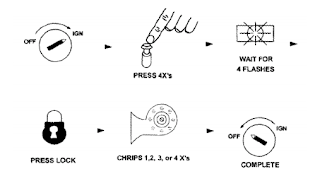 (ON/OFF, ON/OFF, ON) You should hear (1) short chirp. 2. Push the Program/Override button for 5 seconds until the siren chirps (3) times. Release the button. 3. Press Button #1 on new transmitter - siren will chirp to confirm programming. Repeat Step 3 within 5 sec. for up to additional transmitters. 4. Turn the ignition OFF. Note 1: If only one transmitter is being programmed, continue pressing button #1 until dash LED flashes goes out and The system chirps to exit programming mode to prevent unauthorized codes and noise from entering the system. 1. Turn the ignition ON and OFF 3 times quickly, leaving it ON the 3rd time. 2. Press the Program/Override button 5 times and you should hear 5 light flashes and 6 siren chirps. 3. Press #1 (lock) button on the remote 2 times for the 360-336-365-366tx's and 1 time for the regular TX. 4. Repeat the stpes above for the second and 3rd Remote. 2. Press the button for 5 seconds until the siren chirps (3) times. Release the button. 3. Press Button #1 on the remote then you'll hear a chirp. Go back to Step 3 within 5 sec. to program another remote. Note 1: If only one transmitter is being programmed, continue pressing button #1 until dash LED flashes goes out and The system chirps to exit programming mode to prevent unauthorized codes and noise from entering the system. Programming mode is exited automatically after 5 seconds of last code transmission or once 3 new codes. 1. Turn Ignition ON and OFF 3 times quickly, leaving it ON the 3rd time. 3. Press Button #1 on new transmitter - siren will chirl to confirm programming. Repeat Step 3 within 5 sec. for up to additional transmitters.